It is rainy season here in Thailand and true to norm, September is proving to be the wettest month. Almost every evening we have heavy rains here in Bangkok and we’re even having several days with on and off showers. The air is cooler than normal, which is nice, but the humidity hasn’t been below 65% in two months. Still, I prefer rainy season to the hot season. Here’s an audio clip I recorded last night about midnight after the rain had stopped. Various creatures are croaking and chirping in the background as the occassional drop falls from one palm frond to the next. This entry was posted in Uncategorized and tagged Bangkok, monsoon, nature, rain, rainy season, Thailand, weather by christao408. Bookmark the permalink. That audio clip is incredibly relaxing… Must be beautiful, there. Oh, I can just so see you hanging out the window with a huge furry microphone sticking into the trees around your house. *haha* Just like the wildlife filmmakers/sound engineers do. Maybe because everything has been plastered up, but I don’t hear much chirping at night here in Sillypore. @beowulf222 – Nothing so fancy, lah! Just an Olympus pocket-sized audio recorder and a stereo lavalier mic. @Chatamanda – Yeah, I return to the topic of rain and flooding about twice a year. I never cease to be amazed by it. @Passionflwr86 – I’m glad you enjoyed the clip. It is very lush here, even for a dense urban environment. While you don’t see it along the pedestrian footpaths, if you look down from a higher spot, you realize just how green this city is. There’s one empty plot of land nearby that the denuded to build a condo, but the plan fell through. In six months, it is covered with these bushes that are about 2 meters (6.5 feet) high. Nature quickly takes over! @Wangium – Me, too. The winter months in Northern California are really nice, the overcast, day-long drizzle. I love the rains! This time around, the monsoons have been crazy here in Delhi- I have never ever seen it rain so much here. I remember it flooding and the night market closing. I do not have fond memories of the rainy season. Thunder too? That brought back memories when I was running for shelter shopping near the Chinatown district some years ago. @CurryPuffy – Lots of thunder and lightning. Very, very frightening. This is starting to sound like a Queen song. @amygwen – If you get caught out in it, it isn’t so fun. If you’re hanging out indoors, it is much more pleasant. @Dezinerdreams – Somewhere I read that the La Nina effect in the Pacific this year is causing a lot more rain than normal here in Southern Asia. @everyday_yogi – Glad you did. 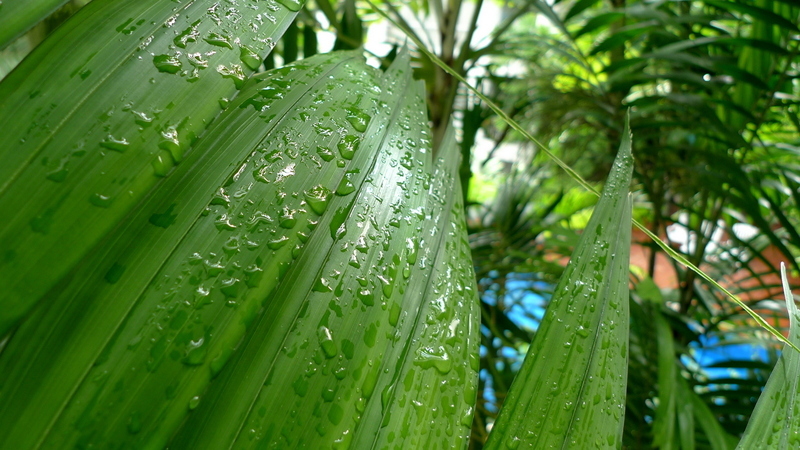 Loved the video and the picture of the rain drops on the fronds of the palm. *gets Raid out* We had our share of rain today… all day. @merihdedeler – Mantastic, I hope you enjoy your trip. Bring umbrellas! @ElusiveWords – I bet it was different there, no flooding sois. @AppsScraps – No need for a sleep machine here, just listen to the whir of the air conditioner! @ZSA_MD – Glad you enjoyed. @Umnenga – That’s true. I don’t think it would take nature very long at all to reclaim this city.